Concrete Elegance is a celebration of both classic and contemporary styles. Utilizing solid concrete construction, any combination from this modern collection will add a touch of ‘chic’ to your project. Concrete. 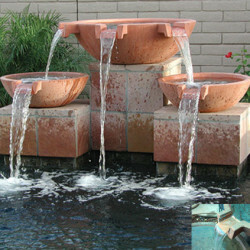 Description: Double Scupper Wok w/ Scuppers at 90º angle. Concrete. 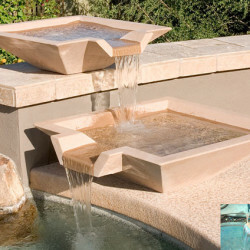 Description: Double Scupper Wok w/ Scuppers at 90º angle. Concrete. Description: Tripple Scupper Wok w/ Scuppers at 45º angle ea. 90º angle total. Concrete. Description: Tripple Scupper Wok w/ Scuppers at 45º angle ea. 90º angle total. Concrete. Description: Tripple Scupper Wok w/ Scuppers at 90º angle ea. 180º angle total. Concrete. Description: Tripple Scupper Wok w/ Scuppers at 90º angle ea. 180º angle total. 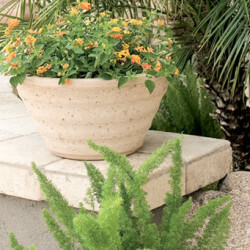 Round Vase Series Planters Colors shown are with standard finish on the left and sandblasted finish on the right. Our sandblasted finish is included on some of our items, and it's available on others for an additional charge. Colors as shown are approximate, and concrete sample chips are available upon request. Custom Colors are available by Special Order. ***Air pockets are a common occurrence in precast products. Any Design Cast product can display air pockets. The frequency and size of air pockets is not controllable in any way. Matching drainage saucers are available to fit most of concrete planters. 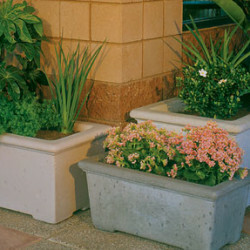 Modern Series Square Short Planters Colors shown are with standard finish on the left and sandblasted finish on the right. Our sandblasted finish is included on some of our items, and it's available on others for an additional charge. Colors as shown are approximate, and concrete sample chips are available upon request. Custom Colors are available by Special Order. ***Air pockets are a common occurrence in precast products. Any Design Cast product can display air pockets. The frequency and size of air pockets is not controllable in any way. Matching drainage saucers are available to fit most of concrete planters. 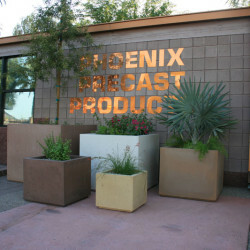 Modern Series Square Tall Planters Colors shown are with standard finish on the left and sandblasted finish on the right. Our sandblasted finish is included on some of our items, and it's available on others for an additional charge. Colors as shown are approximate, and concrete sample chips are available upon request. Custom Colors are available by Special Order. ***Air pockets are a common occurrence in precast products. Any Design Cast product can display air pockets. The frequency and size of air pockets is not controllable in any way. Matching drainage saucers are available to fit most of concrete planters. Oblique Scupper Series Colors shown are with standard finish on the left and sandblasted finish on the right. Our sandblasted finish is included on some of our items, and it's available on others for an additional charge. Colors as shown are approximate, and concrete sample chips are available upon request. Custom Colors are available by Special Order. ***Air pockets are a common occurrence in precast products. Any Design Cast product can display air pockets. The frequency and size of air pockets is not controllable in any way. Matching drainage saucers are available to fit most of concrete planters. Scupper Wok Series Colors shown are with standard finish on the left and sandblasted finish on the right. Our sandblasted finish is included on some of our items, and it's available on others for an additional charge. Colors as shown are approximate, and concrete sample chips are available upon request. Custom Colors are available by Special Order. ***Air pockets are a common occurrence in precast products. Any Design Cast product can display air pockets. The frequency and size of air pockets is not controllable in any way. Matching drainage saucers are available to fit most of concrete planters. Triple Scupper Wok Series Colors shown are with standard finish on the left and sandblasted finish on the right. Our sandblasted finish is included on some of our items, and it's available on others for an additional charge. Colors as shown are approximate, and concrete sample chips are available upon request. Custom Colors are available by Special Order. ***Air pockets are a common occurrence in precast products. Any Design Cast product can display air pockets. The frequency and size of air pockets is not controllable in any way. Matching drainage saucers are available to fit most of concrete planters. 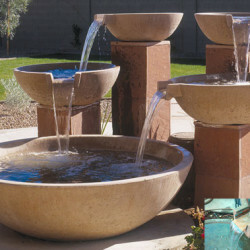 Double Scupper Wok Series Colors shown are with standard finish on the left and sandblasted finish on the right. Our sandblasted finish is included on some of our items, and it's available on others for an additional charge. Colors as shown are approximate, and concrete sample chips are available upon request. Custom Colors are available by Special Order. ***Air pockets are a common occurrence in precast products. Any Design Cast product can display air pockets. The frequency and size of air pockets is not controllable in any way. Matching drainage saucers are available to fit most of concrete planters. Tuscany Scupper Series Colors shown are with standard finish on the left and sandblasted finish on the right. Our sandblasted finish is included on some of our items, and it's available on others for an additional charge. Colors as shown are approximate, and concrete sample chips are available upon request. Custom Colors are available by Special Order. ***Air pockets are a common occurrence in precast products. Any Design Cast product can display air pockets. The frequency and size of air pockets is not controllable in any way. 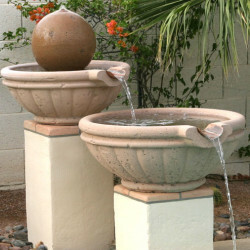 Matching drainage saucers are available to fit most of concrete planters. 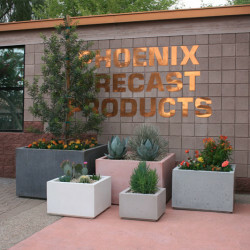 Classic Series Rectangular Planters Colors shown are with standard finish on the left and sandblasted finish on the right. Our sandblasted finish is included on some of our items, and it's available on others for an additional charge. Colors as shown are approximate. ***Air pockets are a common occurrence in precast products. Any Design Cast product can display air pockets. The frequency and size of air pockets is not controllable in any way. Matching drainage saucers are available to fit most of concrete planters. 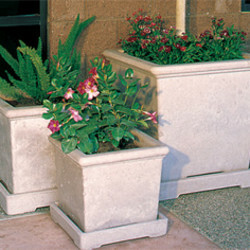 Square Planters Series Colors shown are with standard finish on the left and sandblasted finish on the right. Our sandblasted finish is included on some of our items, and it's available on others for an additional charge. Colors as shown are approximate, and concrete sample chips are available upon request. Custom Colors are available by Special Order. ***Air pockets are a common occurrence in precast products. Any Design Cast product can display air pockets. The frequency and size of air pockets is not controllable in any way. Matching drainage saucers are available to fit most of concrete planters. 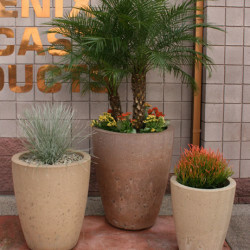 Deco Series Planters Colors shown are with standard finish on the left and sandblasted finish on the right. Our sandblasted finish is included on some of our items, and it's available on others for an additional charge. Colors as shown are approximate, and concrete sample chips are available upon request. Custom Colors are available by Special Order. ***Air pockets are a common occurrence in precast products. Any Design Cast product can display air pockets. The frequency and size of air pockets is not controllable in any way. Matching drainage saucers are available to fit most of concrete planters. Low Italian Series Planters Colors shown are with standard finish on the left and sandblasted finish on the right. Our sandblasted finish is included on some of our items, and it's available on others for an additional charge. Colors as shown are approximate, and concrete sample chips are available upon request. Custom Colors are available by Special Order. ***Air pockets are a common occurrence in precast products. Any Design Cast product can display air pockets. The frequency and size of air pockets is not controllable in any way. 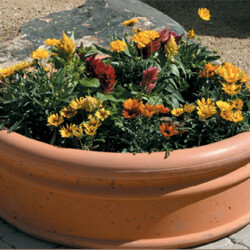 Matching drainage saucers are available to fit most of concrete planters.